With something as delicious and easy-to-make as Tres Leches Cake, you'd think I would have long experience with it, but that's not the case. As a dessert chef, the world of sweets is familiar territory, so my lack of knowledge about this cake added to the intrigue. I decided to explore the history of Tres Leches Cake -- one of many Mexican dessert recipes that are commonplace to some, while foreign to others. I first heard of this dessert from a baker who has been baking here in Austin for about fifty years. He didn't really describe it, but just gave me a slice to try. I am always willing to try a new dessert, but milk cake? It looked fairly ordinary. A dense, moist cake topped with a cloud of vanilla whipped cream. Let me just say that I was impressed. I could have eaten a whole cake. It was amazingly light, very moist and sweet, but not overly so. Calorie wise, it's not light by any stretch of the imagination, being loaded with milk, fat and sugar. But with the proper portion size, it is a most pleasant way to finish a fine Texas meal with a cup of coffee. So what is this cake? Pastel de Tres Leches is a butter cake sometimes flavored with vanilla. What makes it unusual is that it is soaked in a mixture of three different milk products, hence the name Tres Leches. The three milks, when combined, create just the right sweetness, density and "mouth feel" for a rich cake, making it moist but not mushy. The idea of soaking a cake in liquid is not new. There are some traditional cakes that require a good bath in some flavoring. You know them as a Baba or a Savarin, and the Christmas favorite, Rum cake. These cakes get their traditional flavoring from being doused with an alcohol mixture. Many layer cake recipes advise you to brush your cake layers with a simple syrup solution to moisten the cake. The Pastel de Tres Leches takes this one step further, adding richness to the soaking liquid. So how did the Tres Leches come about? It is hard to pinpoint the origin of the confection. There is dispute over where it came from. There is dispute over when it was first created. There is even dispute over what variation is the correct version of Pastel de Tres Leches. After much mind-numbing investigation, I drew two definite conclusions. One is that this cake is very popular in Latin America, especially Mexico and Nicaragua. The second is that it is soaked in a mixture of three different types of milk: evaporated milk, sweetened condensed milk, and whole milk or heavy cream. Going on the assumption that sweetened condensed milk has not been around for a long time, I was trying to narrow down the potential timeframe for the introduction of the recipe. Low and behold, my theory was blown out of the water. It appears that sweetened condensed milk has been around since the 1800's. The product was originally created to preserve fresh milk. That being the case, I gave up on trying to determine when the cake was created. While the facts of its origin may be elusive, the fact of its popularity is not. 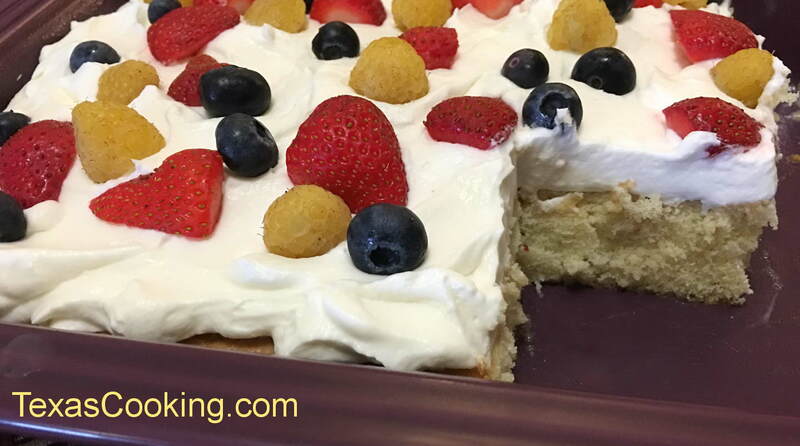 Tres Leches Cake is soaked in a mixture of three different types of milk: evaporated milk, sweetened condensed milk, and whole milk or heavy cream. One thing I particularly like about this cake is that it's a simple and flexible recipe to experiment with. It doesn't require high baking chemistry to work out well, so the exact proportions are not too critical in the milk mixture. Also, it's a neutral flavor that accepts a little flair very readily. What could you top such a cake with? How about topping it with cajeta, a caramel sauce made from goat's milk and sugar, for a truly decadent experience? Or, a simple meringue, commonly used as frosting in recipes from Mexico. Also, nuts, fruits or other tasty ingredients can be added to the batter, and used atop the frosting, as well. There are any number of ways to add subtle distinction to your Tres Leches cake. Substituting sweetened coconut milk for the condensed milk, and an added sprinkle of toasted coconut or fresh shaved coconut will lend a tropical flair. Also, any variety of complimentary liquors can be added to the rich milk soaking mixture. Some recipes call for cup of rum or brandy. Flavored liquors like Kahlua or Irish Cream will work nicely. And fruit or nut flavor extracts or liqueurs will enhance the milk mix, too. I have experimented with this cake, and my recipe has one variant to the original. I add a liqueur to three milks. Preheat oven to 350F degrees. Grease and flour a 9x13-inch baking pan. Sift flour and baking powder together and set aside. Cream the butter and 1 cup of the sugar together until fluffy. Add the eggs and 1/2 teaspoon of the vanilla. Beat well. Add the flour mixture to the butter mixture, 2 tablespoons at a time, mixing well until blended. Pour batter into prepared pan. Bake for 30 minutes. When cake has finished baking, pierce it in 8 or 10 places with a fork or skewer, and let it cool. Combine the whole milk, evaporated milk, condensed milk and liqueur and pour over the top of the cooled cake. Refrigerate for at least 2 hours before serving. Whipped Cream Topping: When ready to serve, combine the whipping cream and the remaining 1 teaspoon of vanilla and 1 cup of sugar, whipping until thick. Spread over top of cake. Because of the milk in the cake, it is very important that you keep the cake refrigerated until ready to serve. Serve chilled. Replace the sweetened condensed milk with 1 cup of Coco Lopez Cream of Coconut in the milk mixture. You can also add ¼ cup rum. In addition to the three milks, add 1/3 cup peach schnapps. You can add cup of diced, drained peaches to the batter. About cup of pecans can be added to the batter or sprinkled on top of the cake before serving. Now, if you like cherries, blueberries, raspberries or apples, you can add them to this cake much in the same way. Well, what about chocolate? Why not add some chocolate syrup to the three-milk mixture, or temper in some white chocolate. This is another one of those great recipes that allows for culinary adventure. Plus, it is just plain delicious. Dorothy Sibole is a pastry chef living in Austin, Texas.